I know that sometimes some of my readers, and some on my blog roll, may think, king of...sort of...that I go " too far" sometimes; sometimes when I do what could be termed name calling. Or giving someone a name or label. Well, it's not like I don't consider all the ramifications of what I write here. So, there were a few who let me know that I was being less than a professional as blogger when I called St. Paul City Council Member Dave Thune a Master Asshat this past April. Don't be fooled by impostors, those pretending to be Master Asshats! There's only one, authentic Master Asshat, and that's Dave Thune! 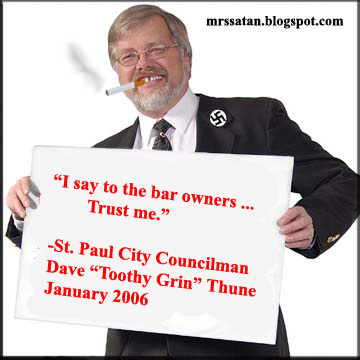 For you see, St. Paul City Council Member Dave Thune is a Master Asshat. Perhaps, he may be the Grand Wizard of Master Asshats. His behavior, as a civil servant - and he doesn't come close to being worthy of that description - is just, plain combative. This is because Dave Thune is...you guessed it...The Master Asshat. A profanity laced email from a St. Paul city councilman is leading to calls for his resignation. St. Paul businessman, Mike Costello said he got upset last week when he saw City Councilman David Thune protesting at the Republican National Convention. "I sent him an email saying how disgusted I was and that I thought he was a disgrace to the city and I asked him for his resignation. I said you should resign," said Costello. Thune responded with an email that said "[expletive] you little [expletive]". 5 EYEWITNESS NEWS obtained a copy of the profanity-filled email which shows it was sent from Thune's official city council email address. When asked if that was a respectful way to deal with a citizen of St. Paul Thune said, "It is a respectful way to deal with someone of the low class that he is." "It was vulgar. It was crude and it was sent from his city desk," said Costello. Thune told 5 EYEWITNESS NEWS he stands behind his four-letter words, even though he said he never really meant to sent the email. "I was shocked. I can't believe he sent it," said Costello. City officials said there is little that can be done to punish and elected official such as Thune for using city property to verbally attack a citizen. 5 EYEWITNESS NEWS asked Mayor Coleman's office what he thinks of the situation. They issued no comment. Costello said he has filed a formal complaint with the city. Thune, who has been critical of law enforcement tactics before and during the convention, said the event would be open to the public. "We need a civil and respectful conversation that listens to all sides," Thune said. "My fear today is that free speech may have suffered during the RNC." Some St. Paul businesses that should have been booming with customers from the RNConvention were nearly vacant. Many are saying their business was non-existent. However, bars and restaurants reported an increase in business in Bloomington and Minneapolis. Thune said he, "would never do it again." "It" being the convention. Don't be fooled by lower-priced, knock-off imitation Dave Thune Master Asshats! If it's not Dave Thune, it is not The Authentic Master Asshat! Well, who was on the welcoming committee? Is the city council of any city hosting a large scale convention part of the welcoming committee? Sure it is. And what was Dave Thune's message to people who were about to spend money in his city? "I don't want a lot of Republicans puking on my sidewalks." St. Paul City Mayor Kommissar Chris Coleman, unless he's changed his mind, said he's not getting involved in this. Oh, really? One of your councilmen tells a business owner and taxpayer to "f--- off" and you're sitting it out. Looks good on you, Coleman, no one in the Twin City area ever accused you of having any guts. Telling a constituent to "f--- off" is what passes for leadership today from the Democrat Party. Of course, those of us paying attention aren't surprised. Somebody let me know when Thune's term is up and if he's running for re-election. I'll donate my time to any opponent running to unseat Thune. Let Dave Thune know what you think about his childish and combative behavior.